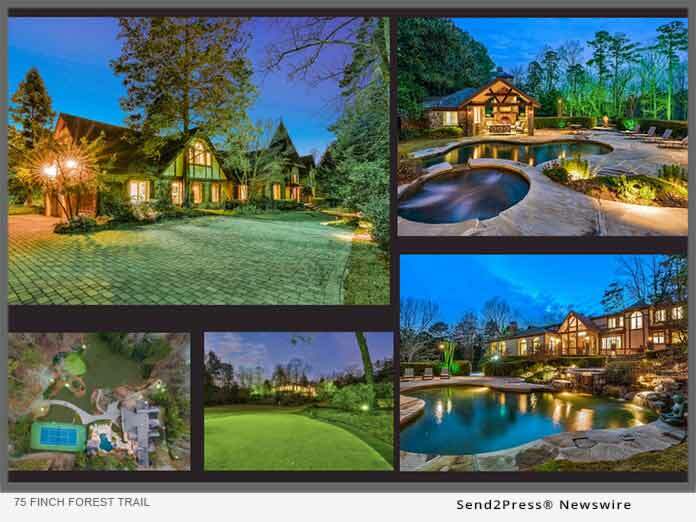 ATLANTA, Ga., Mar 26, 2019 (SEND2PRESS NEWSWIRE) -- Debra Johnston of Berkshire Hathaway Home Services Georgia Properties lists an exceptional and rare private-retreat estate located just north of Buckhead. Tucked away amongst a canopy of evergreen gardens and trees, you'll find 75 Finch Forest Trail offered for $3.95 million. Boasting a sublime fusion of marble, wood, and stone finishes as well as an abundance of old-world architectural charm, this Tudor style residence delivers regal living and entertaining both indoors and out. Perched on a 2.5 +/- acre parcel of nearly flat land, you'll look forward to soaking up everything on offer with this secluded, 6,740 square foot abode with 6-bedrooms, 9-bathrooms, multiple living areas, tennis court, putting green, pool with bar, and so much more. The splendor commences immediately upon entering this serene estate. The paved driveway curls around the entire property and delivers you to the light-filled foyer. Expect to be drawn towards the true heart of this home, the great room. Accented by slate floors, a masonry fireplace, a custom wine room with a steel glass door and high ceilings, 4 large windows flank this space affording guests the opportunity to absorb the ambiance of the outdoors. This gorgeous space also integrates with the bar and screened patio for the ultimate entertaining layout. For a more understated elegance, retreat to the tranquil living room and unwind by the stone fireplace set under a divine vaulted ceiling. The pristine, wood-paneled dining room also features another fireplace, accentuated by a limestone mantel. Expect to be impressed with the recently updated gourmet kitchen that boasts stunning custom cabinets, a beautiful beamed ceiling, marble countertops, a honed marble island, stone floors, walk-in pantry, a breakfast room for informal dining (or use the adjacent screened patio), a La Cornue range, and Sub-Zero appliances. The main floor resplendent master suite, with its honed marble remodeled bath, custom dressing room, and private Ipe wood deck with lush green vistas is perfect for overseeing the emphatic loveliness of this estate. Four-bedroom suites reside upstairs, all of which evoke a rustic beauty, and all the accompanying bathrooms feature marble finishes. Outdoors, adventure awaits. Challenge each other to a match on the new tennis court or refine your swing at the golfer's dream short game complex with a full-size undulating green, sand trap, 2 chipping areas and 4 tee boxes ranging from 15 to 80 yards. You can also explore the enchanting gardens and landscaped lawns or gather together by the walk out pool featuring a bar, kitchen, bath, and outdoor fireplace. You'll relish curling up by the roaring fire in winter or soak up the sun in the pool with hot tub in the summer. This one-of-a-kind resort-like estate also features a sauna, intercom, security system, a full-size terrace level gym, generator, a 1,200sqft basement, and a 1,500 square foot garage for 4 cars. Guests can retreat to their own space via a separate entrance and enjoy the light and bright apartment with kitchen and garage. Debra Johnston is one of Atlanta's top luxury agents with Berkshire Hathaway Home Services Georgia Properties and is a current Chairman Circle Diamond member that was awarded the Top 5 individual agent in Atlanta in 2017. In 2019, Debra became a member of the SportStar Relocation network for Atlanta. She continues to surpass client expectations as demonstrated in her sales volume performance year over year serving her extensive clientele network which includes music and film industry, athletes, Fortune 500 executives, and entrepreneurs. Her exceptional marketing consists of superb photography and video production as well as a prominent internet exposure that translates into maximum exposure for her clients. She is known for her genuine enthusiasm for luxury real estate and for her excellent professionalism providing top customer service. With over fifteen years of experience in the luxury market, Debra is a leader in the real estate field and consistently delivers uncompromising professionalism and ultimately a positive experience for her clients.